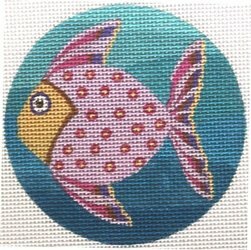 This pink fish swimming in the ocean needlepoint ornament is from Julie Mar. The design area measures 3" diameter. It is the perfect size for a box insert. If you require stretcher bars we recommend two pair of 7" and some thumb tacks. The design is handpainted onto 18 mesh mono needlepoint canvas. You can buy this goldfish needlepoint design as canvas-only or as a needlepoint "kit" with cotton, wool, or silk threads. For cotton we use DMC stranded floss; Bella Lusso for wool and Pepper Pot for silk. This canvas usually ships within 1 week.